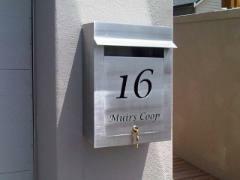 Residential letterboxes for bolting on to a wall or building into a wall. Letterbox banks for apartment complexes or office developments. We can incorporate house numbers and box numbers, business logos, and street addresses by lasercutting the suitable text through the stainless steel. "Thanks, the letterbox has just been delivered! It looks great thanks very much. I will send you a picture of the mounted sign and will also keep you in mind for any future jobs."